Acupuncture is an age-old Chinese technique. It was used as a tool to maintain health and treat various ailments. Hundreds of years of application and documentation showed that placing needles in certain places had certain effects. Principles such as chi (life energy) as well as yin and yang (opposites within the body) were used to try and achieve balance and healthy function of the body. 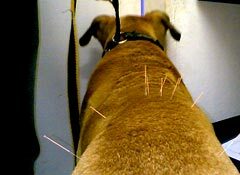 In veterinary medicine, in the Western World, acupuncture tends to be an adapted science. The veterinarian makes a 'Western' diagnosis: a diagnosis according to familiar scientific principles. 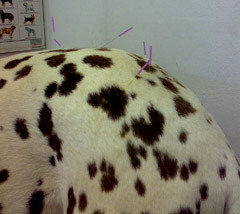 He, or she, then treats this condition with techniques adapted from Chinese Acupuncture. We treat all species, but mostly dogs, cats and horses. An initial consultation is important to assess the patient for acupuncture. A realistic assessment is made at this stage and a time frame for subsequent treatments given. All pets that are under treatment by another veterinary surgeon, require a letter of referral. This ensures that no conflicting advice is given and also prevents the same test or examinations being carried out twice. 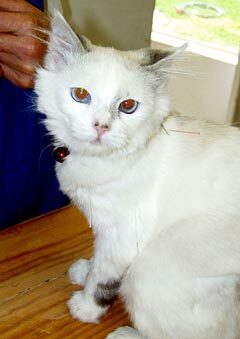 A report is sent back to the referring veterinarian at the end of the acupuncture treatment for each patient. We will visit horses requiring treatment, but a referral letter from the treating veterinary surgeon, as well as any radiographs that have been taken, are required. An initial examination fee, as well as the fee for the acupuncture treatment, is payable. ARTHRITIS: Conditions such as spondylosis, hip dysplasia, osteoarthritis and post-surgical pain are often responsive to acupuncture which palys a major role in reducing pain and relaxing muscle spasms around painful areas. 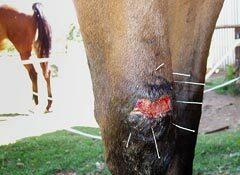 WOUNDS: Slow-healing wounds can cause prolonged periods of discomfort as well as posing a management problem in animals. Acupuncture close to the wound edges has been shown to improve the rate of healing in surgical and chronic wounds. MUSCLE PAIN: Muscles can be injured, in spasm or not responding physiologically due to atrophy or pain. Direct needling of an injured muscle can result in surprisingly gratifying and quick resolution of the problem. SCAR TISSUE PAIN: Scar tissue can cause discomfort and restricted movement. Acupuncture of scarred areas, post-surgery or post-trauma, results in reduced pain and quicker return to normal function. OTHER CONDITIONS: there are many other treatable conditions. 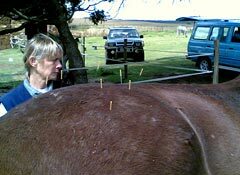 Individual assessment is crucial before ascertaining if the condition will benefit from acupuncture treatments. Acupuncture can be used in conjunction with other treatment regimes, such as non-steroidal anti-inflammatories (NSAIDs) and physiotherapy. 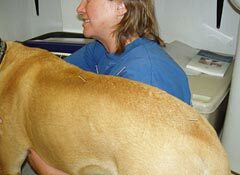 Animals can be exercised as normal, within their limits, within an hour of receiving acupuncture treatment. 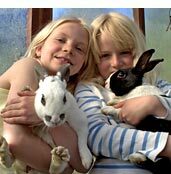 Our aim is the welfare and comfort of the animal and not to advocate one treatment method over another. Usually an animal responds within three to four sessions. Most sessions are between five and twenty minutes long, depending on the animal’s tolerance levels. Usually sedation is not necessary. Occasionally, in very painful conditions, sedation is used and does not interfere with the treatment other than increasing the cost of the treatment per session. Side effects, however, are few, apart from transient tiredness and occasional dizziness. 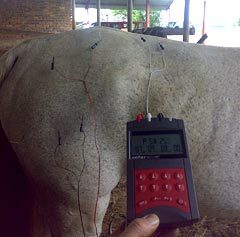 Acupuncture on animals does have to be performed by a registered veterinarian as good knowledge of anatomy and physiology is not only critical to the correct placing of needles, but minimises the risk of damaging vital structures. There is an interruption of the pain pathway. Chronic pain means that the brain is bombarded with the same pain message down the same neural pathway. Placing a needle in or near the affected area produces a short sharp noxious stimulus. This stimulus does not cause major discomfort to the animal but becomes a "competing" pain. Thus the brain recognises the painful area afresh, re-assesses it and modulates its response to the actual sensory input. Using needles gives the pet a "feel good" boost. Animals frequently doze off during treatment or sleep afterwards. 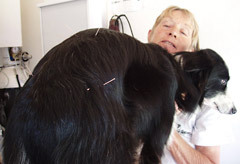 Most animals willingly come into the consulting room after a couple of sessions, as if they know the needles will make them feel good. This is most likely to be due to short term endorphin release. It therefore follows that acupuncture cannot "over stimulate" a nerve or muscle. It cannot make it better than its best natural function. It is more like hitting the reset button on the computer – the original settings (perceptions) are re-installed in the brain, thus allowing a more accurate interpretation of the actual sensory stimulus arriving from the site of pain. Acupuncture can be a very useful stand-alone treatment or adjunct to pain management. It can promote rapid healing and recovery from surgery or injury. It is a drug free therapy, which allows horses, and dogs, to continue working and competing while undergoing a course of treatment.